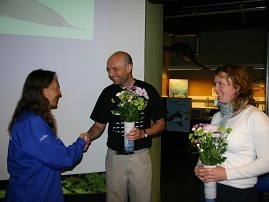 At the end of February 2008, the Jastarnia Group, a group of experts from the environment and fisheries sectors of the countries surrounding the Baltic Sea, will meet for the fourth time to discuss progress made and further implementation priorities for the so-called Jastarnia Plan - the Recovery Plan for the Baltic Harbour Porpoise. This plan, finalised in 2002, was endorsed by the ASCOBANS Parties at their 4th Meeting in 2003. It takes into account the critical conservation status of the only cetacean species native in the Baltic Sea, which despite strict protection on all political levels still experiences higher human-induced mortality than the small population can sustain. The Group will focus on topics like measures taken by the riparian states to reduce bycatch, research and monitoring activities, progress in the establishment of Marine Protected areas and public awareness activities. Another important Agenda Item will be the discussion of a draft revision of the Jastarnia Plan, which updates the document based on recommendations of the previous meeting. The agreed new version will then be presented to the Advisory Committee for endorsement.